I’ll wait while you pick your jaw up from the floor. I have seven email addresses, each with a different purpose. This comes from my past business life where the only way I could manage the email overload was to divide things up so I could focus on dealing with certain types of emails at a time, instead of flitting about from one topic to the next and cluttering up my mind. One for enquiries, one for sales notifications, one for clients, one for family and friends…etc. Nowadays, my business life is winding down as my writing life winds up. Cue new types of email overload! Not a day goes by without an email. Or ten. Or twenty. I’m sure you can relate. Checking my inbox is the first thing I do when I wake up, because for writers, there could be a VERY important email you don’t want to miss, like a contract offer, a movie deal, or a ‘hey, did you notice your book is in the Top 100?!’. It’s easy to get addicted to checking your email, especially now we have smartphones. The Inbox is a world in its own right. A curious, addictive, equally annoying and exhilarating land of information and communication. 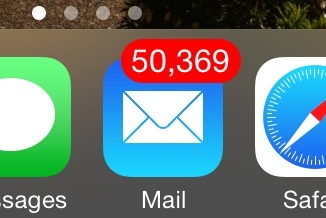 To become a Master of The Inbox would become a full time job. Instead, I’ve trained my eye to scan through the inbox and mentally filter certain messages, focusing on the important ones. It’s like reading a list of ingredients on a packet of food. If I unsubscribe, what if the email they’re going to send tomorrow is exactly what I’ve been waiting for? Okay, I’ll wait till then, and if it’s nothing special I’ll unsubscribe then. Well, it’s sort of useful. I’ll give them one more week to impress me. Why am I still getting these emails? Didn’t I unsubscribe ages ago? There are some informative emails, newsletters, or promotions that I like getting, but please people, for the love of all things holy, YOU DON’T HAVE TO EMAIL ME EVERY FREAKING DAY! And so I don’t always unsubscribe because if I like the person or company or information source I know that I will probably take action on one of their emails at some point (or have in the past), but also, with daily emails I start to become immune to them and don’t really take notice anymore. I’ve been involved in email marketing myself and know how it works – email too infrequently and people won’t remember you or think you’re only emailing them to sell something new, email too often and you get lost in the overcrowded inbox and generally annoy people. Daily inspirational quote – always read as it makes me smile and only takes a second. Message from Mum – always read. You made a sale! – Cool. Wonder if it’s enough to help pay for a personal email assistant. Book blog #1 – I’ll read later. Maybe. Book blog #2 – As above. Book blog #3 – Hmm, maybe I need a new email address exclusively for book blogs. New facebook message from CP #1 (critique partner) – Check immediately. CP’s are fun, and SHE might have a contract offer or movie deal or a book in the Top 100. A friend has tagged a photo of you on facebook – A friend from primary school. Bloody hell. What kind of embarrassing photo of ten-year-old me is online now? Rejection letter from an agent – Um, always nice to get a response, even if it is over a year since I sent the query, but it’s a bit late. I already have one. (yes, this happened). 24 hour sale from fave clothing store – Flag. I’ll look at this during dinner. Oh, but now I remembered there was this dress I saw that I could wear to next year’s RWA conference. I better check now in case they get sold out. Facebook Ads Team: Your Facebook ad has not been approved because the picture uses 20.01% text and our guidelines have a limit of 20% text – Grr. Do you want my money or not, Facebook? Request for guest post or interview – Read, but will deal with this on Mondays when I organise my marketing. Last chance! Don’t miss out! – On what? I can’t remember what they’re selling. Delete. Oops, should have unsubscribed. Oh well, I’m sure they’ll email me tomorrow saying their last chance offer has been extended for another day due to overwhelming demand. I’ll unsubscribe then. Unless I forget and hit delete again. Invitation to book event. In the USA. – Delete. I’d love to go, but I can’t really see myself spending a fortune on airfares and accommodation to attend a one hour event on the other side of the world. New facebook message from CP #2 (critique partner) – Check immediately. She might have some important goss and I can rant and rave about my overflowing inbox. New facebook message from CP #1 (critique partner) – Check immediately. CP’s are fun, and SHE now might have a contract offer or movie deal or a book in the Top 100. Writing newsletter – Check the contents. Either file away to read later – aka – maybe never, or delete. The article on how to make time for writing would take too much time away from my writing so I better just write. After I’ve checked the rest of my emails. Blog or facebook chain letter: write about your 5 favourite gourmet condiments or other such vital information, tag 5 friends, blog on this particular day at this particular time, tag 5 blogs telling them which particular day and time to blog, and instruct them to do the same, sending everyone crazy – Possibly reply if I know the person well, or delete. My brain hurts just thinking about it. Besides, I have books to write. And emails to check. Request to read someone’s manuscript and give feedback – unless they are my critique partners I decline. I love to help where I can, but deadlines and my family life come first and I simply run out of time. Free shipping offer, today only! – Damn it. I did want to purchase something from them, but now that I have to get this publishing paperwork in by today I won’t have time. Let’s hope they follow the lead of the email that said ‘Last Chance! Don’t Miss Out!’ and send another email tomorrow saying they’ve extended their free shipping offer. Some other company – delete. Some other company – delete. I’m really late for my working day now. Note to emailers – email me first thing in morning as those emails are more likely to get read! Now, time to settle down with my manuscript and churn out some words.